Invite bold color and beauty into your home with this handcrafted Tiffany-style hummingbird design window panel. With shades of blue, aqua, pink, and red, this window art is crafted from over 70 pieces of hand-cut glass. Main Colors: Beautiful tones of Blue, Red, and Pink art glass. Dimensions: 12 inches high x 22 inches wide. 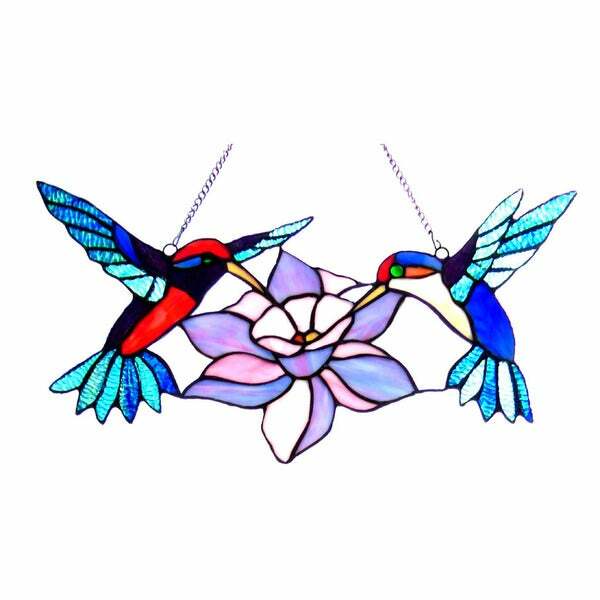 Hummingbird Stained Glass - LOVE IT!!!! Excellent piece, it's exactly what I was expecting. Thank you. I wish they would sell a larger piece of this exact stained glass because this one is small, but the quality is good and I'll keep shopping for outdoor decor! I purchased this for my mother-in-law for Christmas. I was very surprised how beautiful it was when it came. It is more beautiful than the website shows. The colors are very vibrant. It is much larger than I expected and the chain that came with it looks very sturdy. I am sure she will love it for Christmas and it will be a very unexpected and unique gift. Beautiful color. Very happy with this purchase. This doesn’t seem to be as large as specifications but is very nice. I have hung it in my bathroom window to block window which it does but allows the outside brightness. I purchased for my mother for Christmas because she loves hummingbirds. She loved it and is excited to have it hung! Beautiful and uplifting just to glance at it. Love it. It is beautiful. It was a gift and they love it. Good price to! Beautifully done, except missing some edges on the trim . SO PRETTY!!! Can't wait to hang! "If the piece is glass and metal, why did the one reviewer write she needed to touch up the paint? Does it have paint? I am confused on whether this is truly stained glass. Thank you." Hello sashagriff, this lovely item is made from over 70 pieces of hand cut art glass. We do apologize, we were not provided with more details for the customer review. Thank you for shopping with us. "What is the size? Can't seem to find that info"
Hello lollieleadfoot, this item, the length is 22 inches, width is 14 inches, height is 3 in and the weight is 3 pounds. Thank you for shopping with us!